Superb brand new villa with breathtaking views to the Mediterranean. 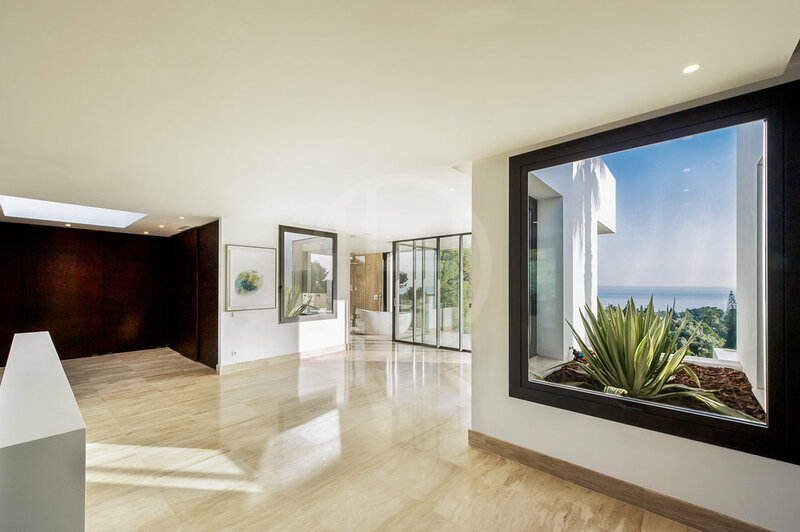 This extraordinary architecture jewel has been built to the highest of specifications and qualities throughout and with all the rooms orientated towards the sea. The villa is consisting of the following layout, from the entrance level: Entrance hall with double height and with transparent staircase, lift, service lift for clothes, guest toilet, wardrobe for visitors, large kitchen with dining room, double height living room, two bedrooms en suite and large porch. Upper floor: Three bedrooms en suite with access to common terrace, living room with fireplace and large master suite with dressing room and private terrace. Common upper terrace. Lower level: Apartment for guests or staff, heated pool and Jacuzzi, small garden, laundry, drying room, machine room, a large multipurpose room, garage for at least 8 cars + outdoor parking for 3 cars. The villa has a lovely flat tropical garden with a stunning infinity pool. Great open and covered entertainment terraces with al fresco dining and lounge areas.